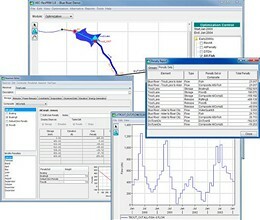 HEC-ResPRM is a reservoir system operations optimization software package developed to assist planners, operators, and managers with reservoir operation planning and decision-making. HEC-ResPRM uses network flow optimization to suggest an idea of the best outcome that can be expected for the system based on any particular prioritization of the system objectives and given inflow time-series. Optimization is the approach to solving problems that seeks the best solution by maximizing (or minimizing) a set of goals in the form of an objective function, subject to specified constraints. Reservoir operation takes into account a number of goals from different interests (flood control, water supply, power generation, recreation, etc.). HEC-ResPRM allows users to pose a reservoir system as a network flow problem. Users create a network schematic of their watershed's reservoirs and stream reaches. They then enter hydrologic data and penalty functions for each reservoir and reach, representing the cost/benefit of each interest in terms of penalty and flow/storage. HEC-ResPRM then uses a network flow solver to find an optimal solution. Users can view optimization results in graphical and tabular format directly within the graphical user interface. 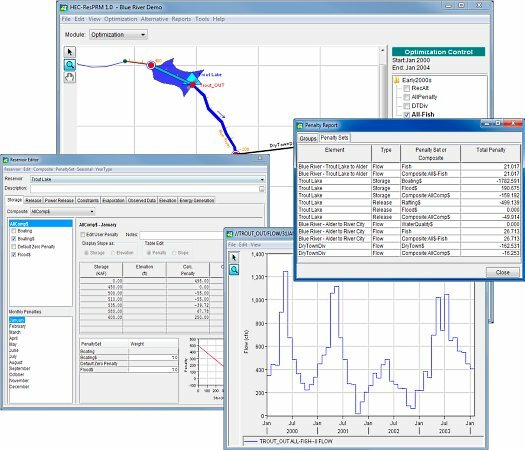 HEC-ResPRM runs on a monthly time step and can be used alone or in conjunction with simulation software such as HEC-ResSim to analyze and improve reservoir operations. HEC-ResPRM can be used to maximize benefits to a variety of goals, demonstrate a best case scenario for given priorities, or visualize the interplay among conflicting interests in the watershed. It can be used to optimize non-monetary values such as ecosystem goods and functions alongside traditional values. HEC-ResPRM is also a useful tool for communicating with stakeholders – allowing them to view tradeoffs between different system objectives. * HEC-ResPRM download link provides gnu general public license version of the software. No one has rated HEC-ResPRM yet. Be the first to rate this product.